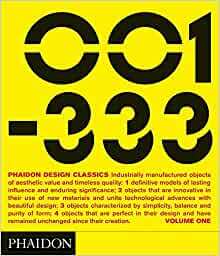 The three-volume book is an authoritative collection of design classics, which will include 999 industrially manufactured products, carefully selected by a group of experts. From cars to furniture, from tableware to cameras, from everyday objects to aeroplanes, this breadth of classic design has never before been collated. These volumes will be the sourcebooks on design from the early 1800's to the present, bringing together patents, prototypes, old advertisements, original drawings, images showing the process of manufacture, as well as rare archival photographs. Over fifty authors ranging from designers to curators, critics, and academics, have contributed with short texts for each objects, providing detailed research and precise information. I've already reviewed this book, and made a complaint about its packaging. But now, after having read it cover-to-cover, I was both delighted and dismayed. As a graphic designer, I have an "eagle eye" for design errors and typographical mistakes, but I also can pick out typos easily. I wished an editor had gone through the galleys thoroughly before it went to print. After about fifty mistakes I said to myself, "I should have been flagging these, then sell them to Phaidon for the next printing." I was too lazy, and continued on to find at least another fifty! One page had a paragraph repeat four times (as if the designer was filling a space, waiting for the "expanded" copy to come in to replace it). Shame on you Phaidon for putting so much effort into photography rights, etc. and barely anything into typography and editing. Original review: One problem with the case and the sheer weight of this product is that it's likely to suffer damage if not carefully packed. While Amazon does have some of the best packing in the industry (especially the shrink-to-a-pallet books that cannot move to potentially damage it's corners), this item in particular was shipped to me using only air bags and a rather thin, large box. The plastic case was severly damaged, but amazingly the books weren't. Customer service was again incredibly accommodating to solving my problem of this damaged item by taking 20% off rather than the hassle of return and replace, which actually would have cost Amazon more. Plus I would have had to carry the nearly 30 lbs to the UPS store! She was also insightful enough to suggest I make a comment on the product page re my experience so that Amazon's shipping department can take special care shipping this product to avoid it's damage. Maybe use "peanuts" instead, or some other method that ensures the weight doesn't make it jostle under the hostile conditions "handler" use with any package--book or chandelier! An outstanding design resource which will no doubt soon become a ubiquitous electric-yellow prop on the bookshelves in style magazines, modern furniture catalogs, and lofts of urban trendoids everywhere. It should look nice next to Rem Koolhaas's "S, M, L, XL". All kidding aside, it's well worth the (Amazon) price. Although I must agree with the previous reviewer who pointed out the poorly designed and tacky plastic "carrying case". Ironic that a design encyclopedia would make such a design mistake. Also, I question whether enough time has passed to justify the "design classic" title bestowed upon many of the more recent entries. These books are excellent, but suffer from two flaws. The first is that there are too few very old items. Only the first dozen items are drawn from man's long history before the mid-ninteenth century, none of these are before the seventeenth century, and nowhere to be seen are such icons as the katana, the ordinary pin, the wheel, or the telescope. Perhaps I have misunderstood the scope of the books by listing these items, but considering the dubious nature of some of the later inclusions, I think they would have been justified. Which brings me to the second flaw: the large number of questionable entries. This problem gets particularly bad in the last volume which deals with the most recent designs, and to some measure it's unavoidable when trying to sift out any sort of 'recent classic'. But there are also more systematic troubles; as one reviewer already pointed out, something like 200 of the entries are dedicated to sofas, chairs, and stools. Surely this is excessive. One gets the feeling that they had set themselves a target nuber of entries, and were determined to collect that number no matter what. Perhaps 999 was too many. Still, in spite of the set's coverage not living up to my ideal (who could agree perfectly on such a thing anyway? ), and in spite of the oft-mentioned awkward packaging, this is an outstanding triad of books. In its pages you will glean the fascinating history of a huge number of familiar objects along with wonderful illustrations (photos, patents, and adverts). A random few that I enjoyed include: the Slinky, Kiwi shoe polish, the Disco ball, and the ice cream scoop. The style is brief and informative, which is good for browsing. These books have me noticing the beauty and functionality of the most mundane objects in my life, wondering about how they were designed. Lastly, the binding of these books is absolutely gorgeous, and the Design Classics look great on a shelf.